Fact 89. A cure for seasickness? Earle's Shipbuilders in Hull were the constructors of one of the strangest ships ever seen. SS Bessemer was designed by Sir Henry Bessemer, the inventor of the Bessemer process that made steel production quicker, cheaper and easier to manufacture, as well as over a hundred other inventions. Bessemer suffered from severe sea sickness when ever he had to travel by ship. He therefore set his brain to designing a ship that would prevent this. He designed a saloon that was suspended within the hull of a ship on gimbals and was to remain level even when the ship was rolling. He then patented his idea in 1869 and went on to make a working model to fully test his theory. The working model of his great idea. Once he had proved to himself that the theory was practical he set up a Limited Stock Company called the Saloon Ship Company as the idea was the passenger saloon would be the 'protected' area. £250,000 was raised and he engaged the naval architect Edward Reed to design it for him. As Bessemer was from Sheffield he turned to Yorkshire yard Earle's Shipbuilders in Hull to bring his design to fruition. The ship was to be a cross channel ferry as this would probably bring the relief of sea sickness to the largest number. It was built as a double ended paddle steam vessel with two paddle wheels on each side, one fore and one aft. This meant that the ship would not have to turn round at each port and just move off the way it had come. 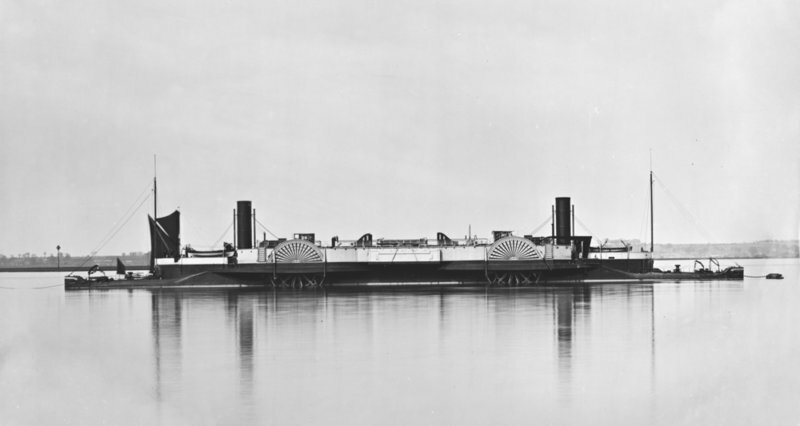 The dimensions of the hull were 350' long by 40' beam (65' across the paddle boxes) and 7'5" draft and a gross tonnage 1974 t. (106 x 12.2 (19.8) x 2.3 metres). 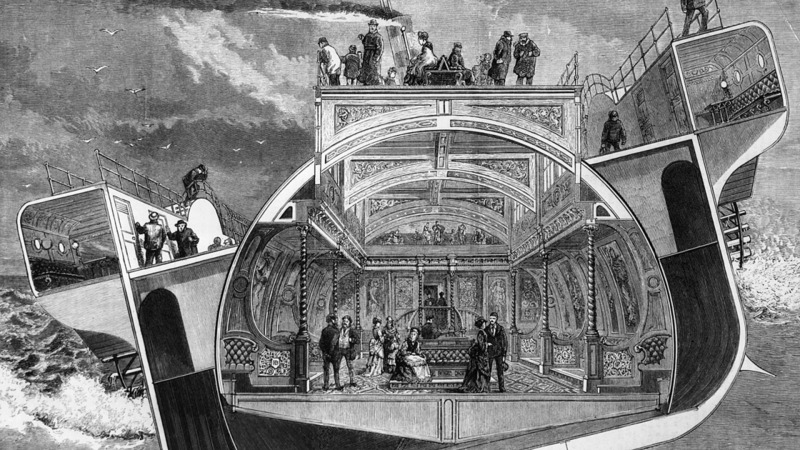 Obviously the main feature of the design was the saloon that was 70' long by 30' wide with a height of 20'. (21 x 9.1 x 6.1 metres). This is the SS Bessemer laying off Gravesend on the Thames in 1875. The saloon was beautifully appointed with Morocco leather seats oak paneling and spiral columns with gilt and hand painted panels. 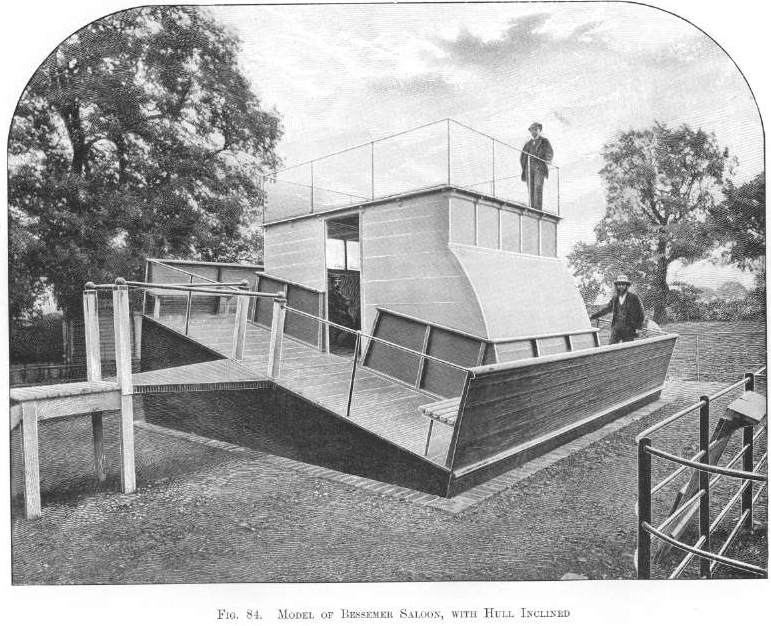 The saloon was suspended on gimbals within the hull and an extra helmsman would watch a spirit level and using an hydraulic system maintain the passenger cabin as close to horizontal as possible. The ship had Earle's yard number of No.197 and was launched on 24th September 1874. The vessel was to be operated by the London, Chatham and Dover Railway Company that became part of the Southern Railway in 1921. In April 1875 a private trial was undertaken from Dover to Calais. Things didn't go too well and on entering the piers at Calais damage was caused to one of the paddle wheels. This was said to be due to the difficulties of steering the vessel at slow speed. With a paddle basically at every corner in theory it should have been highly maneuverable but then I don't know how they were controlled. It wasn't until 8th May 1875 that the ship had it's first public voyage. However it had the passenger saloon locked in place, so to all intents and purposes it was a 'normal' ship, due to not being able to repair the previous damage in time according to Bessemer! It didn't seem to help as after two attempts to enter Calais breakwater it collided once more with the pier and demolished part of it this time. A wood engraved print of the incident from the London Illustrated News 1875. This was one incident too many and the first public voyage became the ship's last. Competion on the route was fierce and these early incidents were enough to put off passengers, and more to the point the investors. The Saloon Ship Company was wound up in 1876 and the ship languished in Dover until taken to the breakers, sold for scarp in 1879. Edward Reed, the naval architect, bought the saloon from the breakers and had it positioned at his home, Hexrable House near Swanley where it became a billiard room. 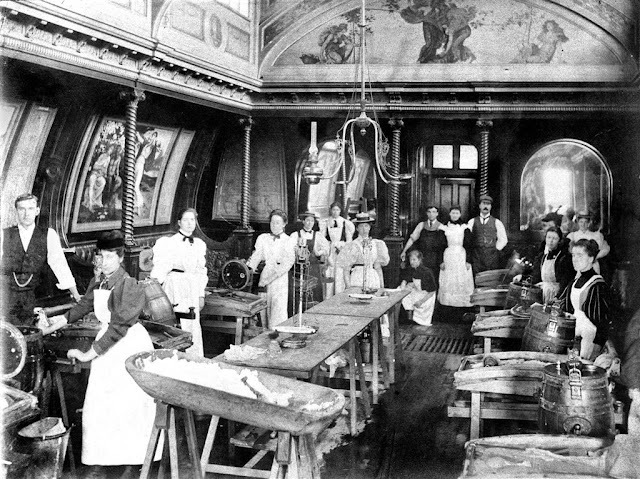 The house later became a Women's Agricultural College and the saloon was recorded once more. 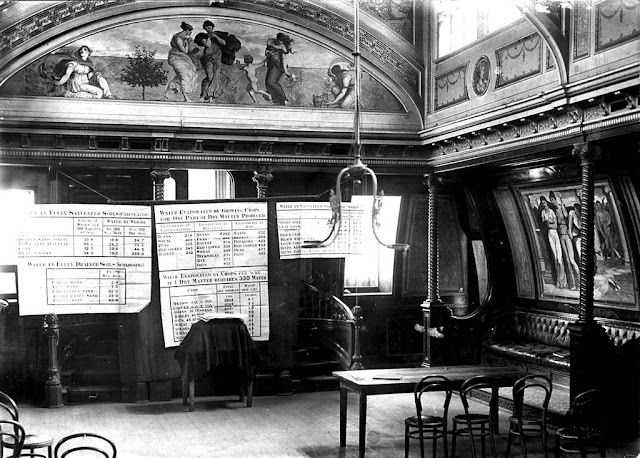 The upper picture shows a dairy class being given in the Bessemer's swinging saloon at Swanley Agricultural College. The lower picture shows the other end of the saloon at the same time when it was in use as a lecture hall. Unfortunately the building did not survive a bomb landing on it in WWII! The venture did not have much luck. The Channel crossing is a shallow sea crossing and as such the waves and swell are short and steep which would make it quite difficult to counteract in a timely manner. On a deep sea passage, across the Atlantic perhaps, the swells may be larger but they come at longer intervals and would enable better control of the hydraulics. In this day and age the whole thing would be automated and I'm sure would be made to work. After all we have trains that tilt when they go round bends. However the prevention of rolling in passenger vessels is now done by computer controlled wings or arms that are extended out of the side of the vessel when underway in deep water and can be contracted into the hull when in confined or sheltered waters. Passive system were water is delayed from 'sloshing' from side to side by damping grids with in an athwartship tank that dampens the rolling motion. Earle's Ship yard took on many one of projects that tested the ship builders skills. This one didn't quite come off but some did. Earle's Road is now just about all that remains of the old yard but at the river end you will get a good view of the strange vessels that now service Siemens factory, shapes that would never have been contemplated in 1875. Fact 88. A route to fame. Not many people have made such large and lasting change to their city as Alfred Gelder. So much so that a main thoroughfare in the city centre was named after him. Sir William Alfred Gelder was born in May 1855 in North Cave to the west of Hull. His dad was William Gelder, and this may show why junior was always known by his middle name of Alfred. William was a joiner, wheelwright and later a timber merchant. It seems that he was educated at the village school until age 15 when he became apprenticed to his father. Nobody seems to know why but Alfred soon decided against following in his father's footsteps and left for Hull to pursue a career as an architect. He found time to marry Elizabeth Parker from Hull in 1877 and they had three children, two boys and a girl. It is unclear how he gained qualifications but 8 years later he set up an architectural practice. It is known that he had a Bachelor of Arts degree and later became a Fellow of the Royal Institute of British Architects, and later still a Fellow of the Royal Institute. In 1892 he took on a partner in the practice, Llewellyn Kitchen and the firm of Gelder and Kitchen was born. Whether having a partner allowed Alfred Gelder more time for other matters or not, it coincided with him taking his first public office, as a member of the Hull School Board. This was a start of 43 years of public service.He was later elected to the Council as a councillor for Drypool ward. He was Mayor from 1899 to 1903 and was made an Alderman in 1925. Gelder started his practice at the time of the Victorian boom in industry and social change, and this gave him ample scope for tendering for the designing new buildings. His Methodist persuasion meant that he knew many of the movers and shakers in the area and was able to secure contracts. The practice became well known for the design of Methodist Chapels such as the that at Cottingham and Brunswick on Holderness Road, as well as all over the country. He also knew Joseph Rank and another of the firms specialisations was the design of buildings for the flour milling for them and many other around the country. He also designed many oil seed crushing mills and this industry became a main stay in Hull along the River Hull corridor. The River Hull looking north east with the lifting Drypool Bridge that was on the new road designed by Gelder and Kitchen and the Clarence Flour Mill that Gelder designed for Joseph Rank and opened in 1891. This building has now been demolished and is to be the site of an hotel in the future. Looking west down Alfred Gelder Street with the Guild Hall on the right and the Old Post Office on the left. Perhaps Alfred Gelder is best known for his name being given to a street in Hull. Alfred Gelder was Mayor and a prime mover in clearing the cramped maze of alleyways and streets to the north of the Old Town, that would have been within the old walls and the replacing Queen's Dock. These days the fact the the senior partner of an architectural company was involved with the design and planning of a very large development would raise more than a few eyebrows. It is said though that the development was at no cost to the rate payers. 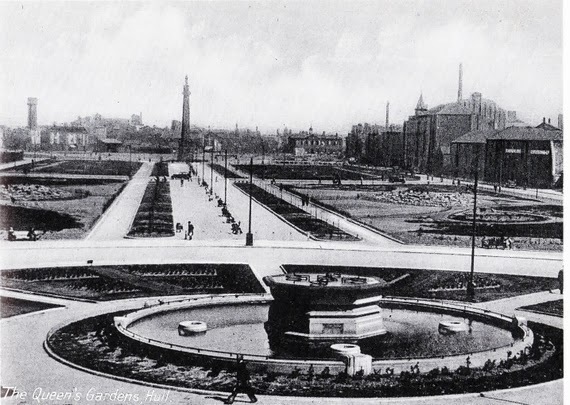 A new road was pushed through to the Junction Street Scheme that was the Creation of What is now known as Queen Victoria square, along with the civic buildings there. The road crossed the River Hull on a new bridge now called Drypool bridge. Originally the road was called Alfred Gelder Avenue, but I think it's change to Street was for the better. In front of the Guild Hall and the Wilson statue at the the junction of Lowgate and Alfred Gelder Street can still be seen the Gelder and Kitchen designed Maritime Buildings. Maritime Buildings, Alfred Gelder Street. designed by Gelder and Kitchen 1900. In 1903 Gelder was the Mayor when the Prince and Princes of Wales arrived in Hull to unveil the Queen Victoria Statue, lay the foundation stone for the new City Hall and a commemorative plaque at the Infirmary that was then in Prospect Street. That year he was also made a knight of the realm in the King's birthday honours for his services to architecture and the City of Hull. In the 1920's Alfred Gelder's son Teddy joined the practice and the company continued in the city until very recently. There are some intriguing reminders left of the back courts and slums that were replaced by the creation of a new route through the town and we now have the marvelous buildings that add much to Hull's built environment. Fact 87. City's son on a pedestal. Everybody knows William Wilberforce was one of the main movers in getting slavery abolished, but not so many know the story of the monument raised to him in Hull. As background to this we can go back to the 1807 Anti Slave Trade Act that actually came in to force in 1808. However, although a victory it banned the slave trade but not slavery itself. This battle was still being fought, and it took until 26th July 1833 to win the war. This was three days before William Wilberforce himself died. on the 29th July 1833. He had asked to be buried next to his wife and daughter at Stoke Newington, but senior members of the Houses of Parliament requested that he be honoured with a burial at Westminster Abbey. He was duly placed in the Abbey's north transept on 3rd August 1833. Just six days following the funeral a letter was printed in the Hull Packet newspaper, dated 5th August, requesting permission of the Mayor (as Hull did not receive city status until 1897), John Barkworth, to hold a public meeting to decide how best to remember the 'high veneration' that William Wilberforce was held in. It was undersigned by 57 of the areas most prominent men. No time was lost and Mayor Barkworth called a meeting for 1100 on Monday 12th August at the Guildhall that was then in Lowgate. The Mayor opened the meeting and the first item on the agenda was to appoint a Chairman for the meeting. The general call went round the room for the Mayor to take the role. The next business was for the gentlemen gathered to express their views and lay before him such resolutions as they might seek to have adopted. One of the last to stand up and give their thoughts was the Rev. Henry Venn, who was the Rector of the Parish on Drypool just outside the walls of Hull to the east. 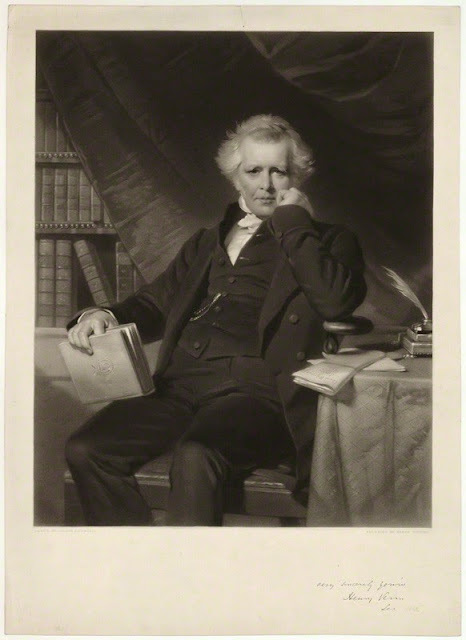 The Venn family were well connected to the Wilberforce family as Rev. Henry Venn's grandfather, also Rev. Henry Venn, and his father, Rev. John, had been both been founder members of an Evangelical Anglican movement whose common political goal was the abolition of the slave trade and the freeing of those held. The group became known as the 'Clapham Sect' as John Venn was the Rector of Holy Trinity Church in Clapham. William Wilberforce and his wife Barbara lived round the corner and he was also a member of the sect. The families would meet daily., so it was right for Henry Venn to take a leading role in the search for an apt tribute. A memorial was suggested as well as having an institution built in his name, such as an asylum for the destitute. This last idea was soon dropped as there was too many questions to be answered such as the management, who would be allowed in etc. The idea of a memorial was adopted, and then the discussion started about what sort of monument. A monument in Holy Trinity Church was put forward, but Venn thought that out of 100 visitors to Hull only 1 or 2 might know it was there. Venn persevered with the idea of a obelisk or pillar, something that would venerate Wilberforce as much as the military heroes that had columns erected in their honour. Nelson's Column was not erected until 1843 but there were several others around the country at this time. At the end of the meeting it was resolved that an obelisk or pillar would form the most striking and appropriate memorial and that a subscription be opened to raise funds. By 13th September a total of £541 had been raised, subscribed by many of the great and good of the area. There is no evidence that the subscription was opened to the general public for them to contribute also. One fly in the ointment that a meeting was to be held in York for the purposes of finding the best method of honouring the memory of Wilberforce. This seems to be a case where York felt the responsibility should not be left to the provincial town of Hull, and York could do it better. There was some consternation in Hull as a county, and nation wide appeal had gone out for funds for the pillar in Hull and it was felt that York's bid would divert funds. The meeting in York was attended by many wealthy people form all over the Ridings and Northern counties and quickly raised funds. Their aim was to open a benevolent institution in the name of Wilberforce. This was to be an school for the blind and funds quickly arrived, whilst those for the Hull monument slowed to a trickle. However, the local people, and publications, got behind the bid and money still arrived. Several sites for the monument were proposed. One was Kingston Square, where the New Theatre is today, another was near where Parliament Street is today, down Whitefriargate, where the workhouse stood. Another was on Nelson Street, near the pier. Another site further to the west on the Humber Bank was also proposed as was a spot near to the Humber Dock Bridge, where the marina lock pit is today. The location chosen was presented by the Dock Company to the west of the bridge that joined Queens Dock and Princes Dock, near St. John Street and at the end of Whitefriargate as it would have the best aspect for the main road and would be seen by everybody coming to Hull. By the commencement of 1834 another appeal was made around Yorkshire as the Hull committee had decided that the column should have a statue on it. This was partly to counter York's project and ensure that the monument in Hull was the preeminent monument to Wilberforce. The fund stood at £715 and the amount needed was £1100! Public meetings were held in many towns and cities but most of cash raised went to the York project. However by March the committee had appointed John Clark of Leeds to be the architect. His design was for a fluted Doric capped with a corniced drum. The base was a square capital with a deep moulded plinth with urns at the corners and other decorations. By July John Clark had placed an advert inviting tenders from stonemasons for the work. The work was to be of Bramley Fall or Meanwood stone, both types of grit stone that came from quarries near Leeds. Bramley Fall stone was used and it was widely used in dock construction, and parts of Euston station. Meanwhile work began on the foundations and on 1st August 1834 a ceremony was held for laying the foundation stone. The honour went to Richard Bethell MP for the East Riding using a silver trowel handed to him by Rev. Henry Venn. A inscribed brass plate was also inserted in the foundations. The silver trowel used at the laying of the foundation stone. By the time the foundations were completed in March 1835 the stone masons had been appointed. These were Myers and Wilson of Hull who went on to be one of the most prolific builders of the age. George Myers started as an apprentice in Beverley and here he met Pugin, the Gothic Revival architect who would who went on to assist in the new Houses of Parliament. Pugin called him 'a rough diamond, but a real diamond' who could work without proper architectural drawings if required.Myers and Wilson set up business from yards in Paragon Street and Carr Lane. This was their first major project. Wilberforce in ceremonial robes, left hand clutching them to him and the right holds a scroll, probably the Antislavery Act. 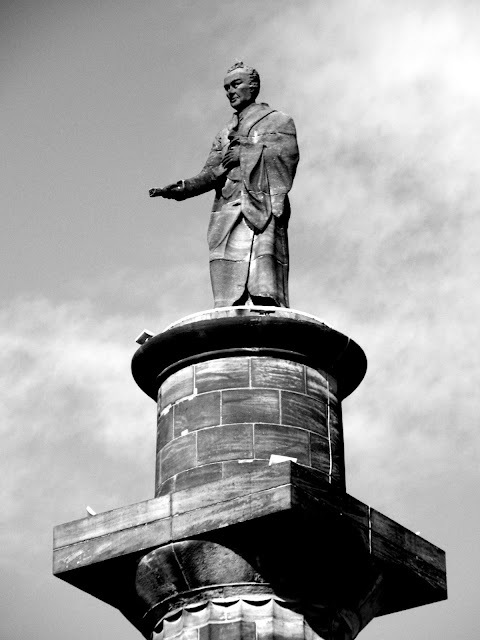 In April 1835 a meeting stated that the monument would be incomplete without a statue but an extra £290 would be needed. They asked current subscribers to increase their pledge by 25% and it seems all did so. In November 1835 the statue was placed on top of the completed column. The column is 90 foot high and the statue is 12 feet tall made of the same grit stone as the column. Who carved the statue has been lost. A hundred years later the local paper said it could read 'Feort 1835' on the skirt of the statue. No name of sculptor, builder or stone mason at the time can be found. It may be that a Mr. Feort was a jobbing continental sculpture that was employed by Myers and Wilson and moved on. Wilberforce monument by what became, and still is, Monument bridge. This picture must have been taken after 1872 as that is when the Dock Offices, now the Maritime Museum, were completed. This could have been the end of the story but time marches on and it's location became a problem. The column had been illuminated with gas and a drinking fountain placed at its foot. The electric tram wires were said by some to desecrate the monument and at some stage the wires were actually suspended from the column. The area of Hull also became a focal point of the traffic and the monument became more of a block to developing the area. In January 1934 Concillor Robert Tarran, owner of a construction company, had agreed to disassemble the monument, move it, reassemble it at a new site at his own expense. The utility companies also offered their services free. The new site was to be the area of the old Queens Dock that had become redundant and had been filled in to form pleasure grounds, or what we now know as Queens Gardens. There was a worry that the monument's foundations at the new site would not be strong enough. The City Engineer denied this and the final site was at the end of the gardens, rather than in the middle as had first been assumed. 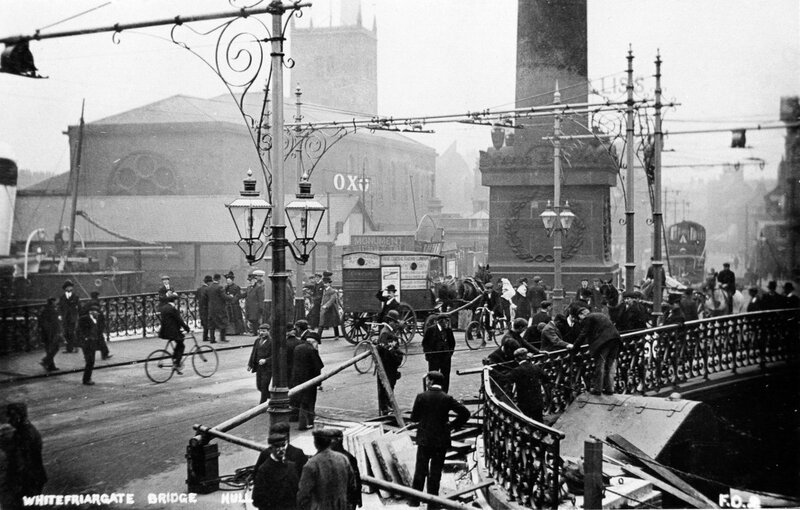 The Monument at the old site with scaffolding ready to take the column down in April 1935. Whilst the scaffolding was in place for a charge of 2s 6d during the day, or 1s in the evening people could climb the tower for the view and over one thousand took the opportunity. The money went to the Lord Mayor's Jubilee Fund. The statue was brought down and placed in a marque near to the new site in Queens Gardens where it was joined by other Wilberforce artifacts and again people paid to view the exhibits. This time the money was shared by the Lord Mayor's Jubilee Fund and the Archbishop's Appeal Fund. There was also a competition by the Mayor to guess the weight of the statue. At this time answer could be given to the question as to whether the column was hollow, and if so was it filled with rubble as some suggested. It was hollow but was not filled in. At this time there was talk of fitting a spiral staircase inside the monument but it was not carried out. On 19th April 1935 a box of souvenirs was placed in the foundations when the Gardens were opened and the monument rededicated. The souvenirs included photographs, maps, a Jubilee crown piece and other coins, a Wilberforce medal from 1906 and news paper cuttings. The new site of the Wilberforce Monument at the east end of Queens Gardens not long after completion of it's relocation. It originally cost £1250 (£90,500 today) to erect the monument in the first place, and £70,000 to move it (£1.500 then). This blog has largely been written with the help of a little book written by Dr. Carolyn Conroy called 'Homage to the Emancipator, Hull and the William Wilberforce Monument'. It was produced to raise funds to have the monument lit for the City of Culture 2017. As far as I know this is going to happen at some stage in 2017. 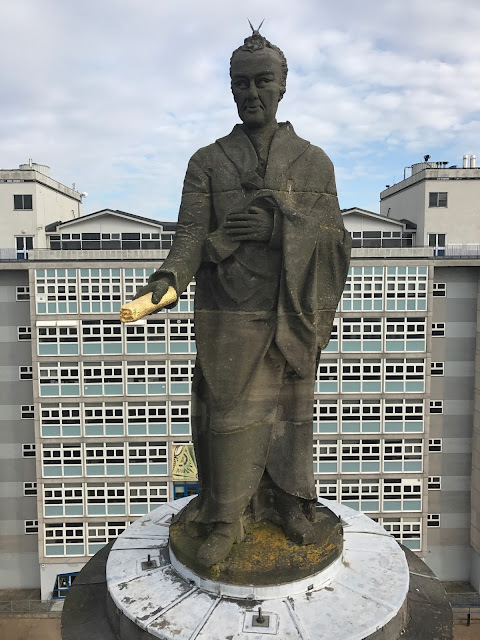 The final item that can be reported was that after obtaining planning permission the scroll that the statue of William Wilberforce is holding in his right hand atop the column was gilded. The work took three days and was carried out by Royal Gilders Hare and Humphreys. It had two 'coats' of 23.5 carat gold leaf that just adds that glint in the sun, and will certainly stand out when it is lit up. The statue on the column in 2016 with Hull College behind. The very last thing to say about the Wilberforce monument is that it is still here. Despite the City of York's big hitters trying to upstage our memorial to a son of our town the School for the Blind that they constructed with the money raised was closed in 1958, and Hull's monument is still here, golden and due to be lit and seen right round the world during City of Culture 2017. Fact 86. Hull's own Dorothy. Hardly known at all, but born in Hull four months before the much venerated Amy Johnson Dorothy Mackaill went on to carve a career in one of the toughest industries, film. Dorothy was born 4th March 1903 probably, at 15 Newstead Street, Princess Avenue in Hull where the family were living at the time of the 1911 census. Her Father, John, had been born in Leeds, in 1874, but seems to have come to Hull aged 16, to 39 Brook Street, near the Infirmary which is where the Prospect Centre is now, to live with his Uncle, also John. The uncle was a Grocers outfitter and commissary. With him was his one year younger brother, Thomas. John junior was a grocers assistant and Thomas was the errand boy. By 1901 he had married Florry Wise, or Florence more properly, or usually called just Flo. She was from Northampton, and they were now living at 5 Blucher Terrace, Waterloo Street that was to the north of the city. They had their own house and their neighbours were lighter and rully men. His trade is given as a grocers manager, but Flo had no profession so they must have been doing okay. In the 1911 census John is said to be a Grocers Manager for the Maypole Butter Company as a Maypole and Tea Dealer. Maypole Dairy started in 1887 when three brothers of the Watson family set up a margarine business in Wolverhampton. By 1898 Maypole were the largest sellers of margarine in the UK. In that year they merged with George Jackson's Dairy business. The Watson's had all been apprentices to Mr. Jackson. The dairy business were the largest retailers of butter in the world at that time. The had 185 shops and 17 creameries between them. All employees were included in a profit sharing scheme. By 1908 they had 506 shops and were the largest vendor of tea, butter and margarine. The company continued to grow until after WWII when Unilever absorbed them. The Maypole trade name is owned by Morrisons Supermarkets though. In his spare time John ran a dance studio and Florence loved the theatre so her head was full of the stage life from an early age. In fact she was teaching at her Father's dance school when she was only 10.She attended Thoresby Primary School. In 1914 her parents split up but Dorothy stayed with her Father. It seems that he had a string of housekeepers to look after his house and his children Dorothy and Thomas and finally married the ninth applicant in around 1921, an Amy F. Stephenson. Before this Dorothy had decided that a life on stage was for her and as a rebellious lass she left for London to seek her fortune. She didn't make the big time straight away and eked a living with little walk on and bit parts along with parts in the chorus with show girl troupes. It was not enough to keep body and soul together so she contacted her father. Despite him not being over enamoured by her career choice he saw that she was determined and paid her board and lodgings for her, along with acting lessons. In 1920 she made her first un-credited film 'Face in the Window' in England. She then moved to Paris and was 'spotted' by a Broadway stage choreographer who told her he could get her work in America. So of she went on found work with in the chorus of the long running Century Revue variety show. at this time, about 1921 she was also appearing in several short comedy films made in New York, called the 'Torchy' series. A little later she joined the Ziegfeld Midnight Frolic revue and when dancing her she made life long friends of Marion Davis and Nita Naldi. Stage ensemble from the Midnight Frolic with Will Rogers (center), 1917. From the Theater Collection. Museum of the City of New York, 74.92.51. Dorothy Mackaill in Photoplay Magazine 1923. She was eventually spotted and signed up to Associated First National Films and headed to California. In 1921 she made 'Bits of Life' with Lon Chaney and continued regularly making films until her first star billing came in 1924 when she was the leading lady in 'The Man who Came Back'. She always had invites to social events through her friend from the Chorus line. 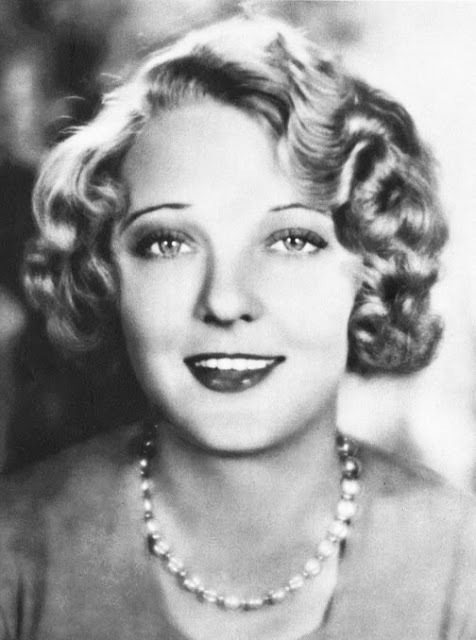 Marion Davis was lover to William Randolph Hearst the Millionaire, and Nita Naldi was friends with Rudolph Valentino and his wife and both were appearing in films too. In 1924 she was voted a 'Baby Star' by the Western Association of Motion Picture Advertisers of America. 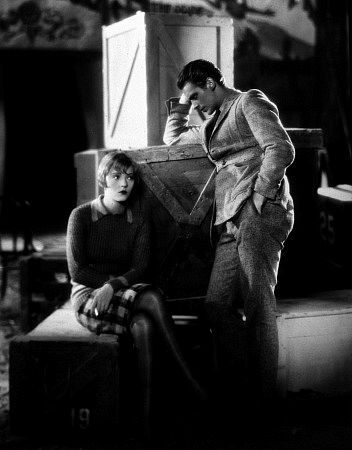 Dorothy with Douglas Fairbanks Jr in 'The Barker' 1928. When she first arrived in America she still had a strong 'Hull' accent, so it was perhaps just as well that this was the silent movie age as she was always depicted as an 'all American girl'. By the time she made her first 'talkie', or actually part 'Talkie' she had lost her accent completely. This was the film in 1928 called 'The Barker'. In that year First National Films was bought by Warner Brothers and Dorothy's contract was not renewed. In 1931 New Movie Magazine said she was the richest women in Hollywood. She did go on to make many films for other studios. In 1932 she starred in the Columbia Pictures with Humphrey Bogart playing his first leading man role opposite her. Her best roles were light comedies and romances. Her last film was made in the UK 'Bulldog Drummond at Bay' and after this she retired. She had invested her earning wisely in Los Angeles property and so was able to live well off the proceeds. Once she retired she looked after her mother Florry until she died. She fell in love with Hawaii when making a film there in 1929. She bought a place there in 1934 and moved there permanently when her mother died in 1955. Her father died in 1959 and left £11400 but as the executor was the Bank I think his wife was dead or divorced. He was living at 83 Claremont Avenue when he passed away. Dorothy appearing in 'Safe in Hell' of 1931. Dorothy married three times, none of them lasting very long. Her first husband was a German film director, Lother Mendes between 1926 and 1928. Her second was the radio singer Neil Albert Miller from 1931 to 34 and the last, an orchid grower, Harold Patterson from 1947 to 1948. She had no children with any of her husbands. She moved to Hawaii permanently in 1955 and lived at the Royal Hawaiian Hotel off Waikiki Beach doing publicity and guest celebrity. She spent her time playing Gin Rummy, sun bathing and swimming in the sea every day. She was coaxed out of retirement to appear in two episodes of Hawaii Five O in 1976 and 1980, but mainly enjoyed her retirement in Room 253. Towards her end she decided not to continue treatment for her kidney problem and died peacefully in her room at the hotel on 12th August 1990. Her ashes were scattered off Waikiki Beach were she swam almost every day until near to her death. Dorothy in her last appearance on the small screen in the Episode of Hawaii Five O 'School for Assasins' in 1980. Dorothy made 66 films of which 26 were 'talkies'. She is much better known in America than in the UK. She returned to Hull only twice, once in the 1930's when she was at the height of her fame and she was mobbed where ever she went. She also returned in the 1940's when she toured many dance and stage schools passing on to the young that they too could follow their dreams. She may well have loved to take part in this years City of Culture if she was still here as she followed her dream. I forgot to add that she was finally officialy remembered in Hull when a Heritage Blue Plaque was unveiled by a local Ward Councilloron. On 10th July 2015 the plaque was proudly displayed on Thoresby Primary School where she had attended when living in Newstead Street. Fact 85. Safer old age with help from Hull. With the 'Baby Boomers' of Britain, and the Rest of the World, reaching a certain age many will be fortunate that Christian Langton did not follow his first career plan of becoming a hotel manager, as he went on to develop the bone density scanner that detects bone thinning which is important for older people to try to stay out of hospital following fractures. He was brought up near Doncaster, and obviously always thought 'out of the box' as he used to breed ornamental pheasants and peacocks in his teens. After A Levels he wished to take a degree that combined chemistry and physics. There were only three such courses in the UK, and Hull was one of them. It wasn't that popular course, as after choosing Hull, he found there were only two of them on the course! He spent his three years at Needler Hall of Residence and seems to have contributed fully to student life with concert party appearances, tennis, dorm. raids and I expect he became familiar with Beverley Road and Newland Avenue. However, after witnessing a fellow student being hauled over the coals for a poor chemistry report, he did not neglect his studies. It was in 1977 at the end of his first year, when his defining moment came, courtesy of his grandmother! On a visit to her orthopedic surgeon, Richard Porter, she asked him if he had any summer jobs for her grandson. Chris. Langton got the job and for the next two summers worked with Richard Porter at Doncaster Hospital assisting with research into back pain. During this work it became clear that the wards were full of ladies with broken hips following falls. The easy fracture was caused by bone wasting called osteoporosis. This bone thinning affects 1 in 3 women, and 1 in 5 men, and the resulting fractures, mainly to hips and wrists following falls, and compression of the spine resulting in old ladies getting shorter and widow's humps, lead to 25% dying within 12 months and 25% of them not being able to live independently again. Chris Langton went to the Applied Physics department at Hull University, Stuart Palmer, and the three of them mulled over the problem whilst he completed his first degree. Following this he went to Aberdeen University for a Masters in Medical Physics. They managed to secure a Medical Research Council grant and three years later produced a prototype scanner. The machine used ultrasound to measure the bone density in a heel bone and so give warning of thinning. He was awarded a Phd. by Hull University for this work. The prototype was quite clunky as it involved a water bath and two very heavy and expensive components so to develop a more marketable piece of equipment the three of them formed a company called Osteosonics, and with a Danish company, came up with the UBA 1001 (Ulstrasonic Bone Analyser). A fair bit of media attention followed including the BBC science programme 'Tomorrow's World' where presenter Maggie Philbin discovered that she suffered from osteoporosis! The attention also caught the eye of a US company Walker Magnets Group, and a new company was formed, Walker Sonix Inc to develop the idea further. The UK head office was at the Newland Science Park attached to Hull University. In 1989 the UBA 575 was unveiled. The commercial UBA 1001 scanner. Next came a portable version to use with thorough bred race horses. As these animals would stand still long enough in the scanner a skin contact model was developed that required no water bath. This was then spun out by a company called McCue and Chris Langton. They were trying to have the equipment certified for use in the USA and a bogus patent court case meant that contracts had to be torn up and Mr. Langton made no money. At this time blue prints were stolen and Phd Thesis being copied! Langton has gone on to refine and develop new uses for the system, including a flat bed scanner for newly born babies. In 2007 he was awarded a Doctor of Science degree by Hull University and with it the title of Professor. 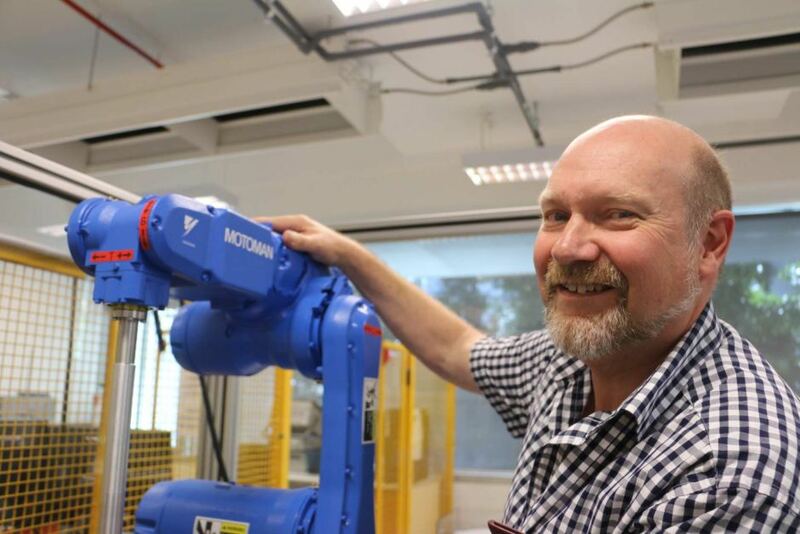 In 2007 he accepted a new challenge and moved to Australia to accept the professorship of Medical Physics at Queensland University of Technology in Brisbane. His now wife and son could not settle so he commutes every three months between the two hemispheres. He is a bit of a petrol head and currently drives a 1976 Porsche 911 Tigra and a Porsche Cayenne. Professor Christian Langton in Australia. He continues with his research and development in Australia and returns back home regularly. It must be a great feeling to have an idea and to see it through from design to use and all facilitated by help from Hull University. This is just one field that the University excels at a world class educational establishment and a world class development that has made the world a better place. Professor Langton's scanner appears in the list of '100 Discoveries and Developments in UK Universities that changed the World,' and is one of eleven in the list of developments in '60 Years of Research in the NHS benefiting patients'. Professor Christian Langford has also been awarded an Honorary Doctorate by the University of Eastern Finland. The very formal ceremony (above) was part of a five day event that includes a ball, a gala, a banquet, procession, church service and cruise! No wonder they are only held every five years. Humbrol started out in Kingston upon Hull, or just plain Hull, in 1919, under the name of the Humber Oil Company. It started as a maker of bicycle oil to service the boom in cycling in the flat lands around Hull. By 1935 people had been asking if they would produce a paint for renovating bikes, and this is when they developed their art enamel paint. The paint was only produced in black and was sold in a tin with just enough paint to restore the bike frame and mud guards, so no waste, and cost 6d. Within two years there was a range of 12 colours. The Humber Oil Company factory on Hedon Road in Hull. In the 1950's the plastic model kit became popular, especially with young lads, and under Gerald Barton the company changed it's name to Humbrol and started to develop a line of paints to cater for this growing market. The paint was produced in 1/2 oz or 14 ml tins that had the code and the colour inside on the lid. Later the paint was called 'One Hour' paint as it was supposed to dry in that time and the range grew to 50 shades. The paint has also been available in 2 oz (50 ml) and 5 oz (120 ml) and spray cans. On the left can be seen a tin of Art Oil paint in a slightly larger tin. This was produced from about 1958/59. The One Hour paints in the slightly smaller tin were introduced in about 1961. In the late 1960's the company started to produce specifically matched colours to the original colours for the bodies and camouflage of the Luftwaffe, RAF, USAAF etc and also the shades that were matched to the various UK train companies, all to make it easier for modelling enthusiasts. The PL15 display case for Humbrol paints that was found in every model shop. In 1976 Humbrol was bought by Hobby Products, part of the Borden Inc.. Borden also bought the French model maker, Heller, in 1981, and Airfix models joined the group in 1986. There was a bad fire in the Hedon Road factory in 1986 when an acetone spill ignited and caused the death of a young female employee. By 1994 an Irish investment Group, Allen and McGuire, bought the group and during restructuring sold off the French Heller Co. They then placed Airfix and Humbrol together under the Humbrol name. Heller continued to make models for Hunbrol, so when they went bust, they brought down Humbrol and into administration in 2006. Later that year Hornby Hobbies Ltd. bought parts of the business, and still own them today, although the Hedon Road factory was closed down. Much of production moved to China, but over half has now been brought back to the UK and the Humbrol brand paints are now made in Manchester and London and the range has further extended to 171 shades. 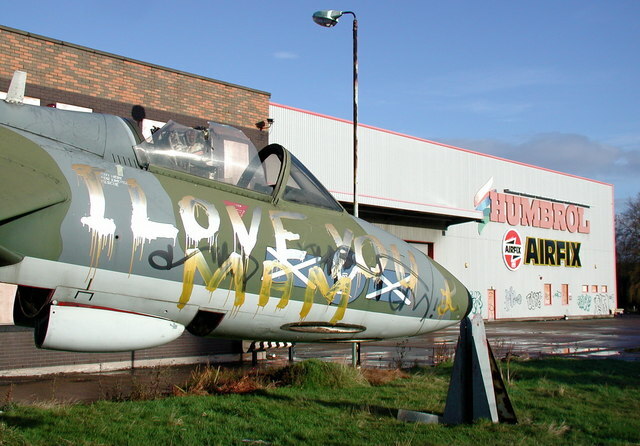 The 1957 F6 Hawker Hunter fighter plane X509 had flown for 54 Squadron before being retired and used at the gate of RAF Chivenor. When that base was closed it was removed and restored before being restored by apprentices at BAe Brough and being placed outside the Hedon Road factory of Humbrol. The factory closed in 2006 when the company was sold. This picture was taken in 2007. 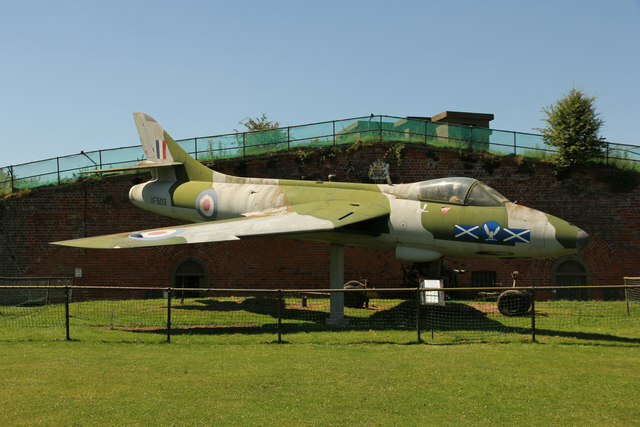 The aeroplane was saved and once again restored before being palced in the saftery of Fort Paull, east of Hull. Humbrol paints may be gone from Hull, but is not forgotten, as the name lives on and model makers come from every generation. I well remember get a model for Christmas and then later up to the model shop to get any paints that I didn't already have, along with a tube of Britfix polystyrene cement that was also made by Humbrol. It was so difficult to not get it everywhere, especially the cockpit canopies. That was a sign of a real beginner! I hope this Hull history lesson has brought back some memories for some of you. Fact 83. Ronnie Hilton was the cover version king. Ronnie Hilton was born in Hull on 26th January 1926. I have seen his father as being a soldier or a seaman, but he left Paisley Street School, just to the west of West Park (Where the KCOM Stadium is today), at age 14 after his four brothers signed up for the forces. He went to work in an aircraft factory until he lied about his age and managed to sign up for the Army and joined the Highland Light Infantry, supposedly aged 16. He must have done well as I have read that as a Corporal he was heard singing in the shower by the Regimental Bandmaster and ordered to audition at the band room. From then on he was the appointed resident singer with the regimental band! Whilst singing with the Jonny Addlestone Band he was heard by Walter Ridley, the A and R man for HMV records. They became very good friends. It was Walter that suggested he change his name and have an operation to remove a scar near his mouth (I have read that it was a hare lip but it certainly isn't that obvious in the picture above). It was also Walter that first arranged a recording contract for him. His debut as Ronnie Hilton was on stage at the Dudley Hippodrome in July 1954. He was also singing on the radio with the Northern Variety Orchestra, and the sewing machine factory changed their lunch time in the canteen so that his fellow workers could listen to him sing. He continued to work at the factory, along with his singing until the release of his second single 'I still Believe,' with 'Veni Vidi Vici' on the B side later in 1954. Ronnie's second album from 1958. Ronnie had a minor hit with a cover of the 'Yellow Rose of Texas' just as Bill Haley's 'Rock Around the Clock' went to No.1, and the life of a crooner became difficult. He had a No.1 record with 'No Other Love' in 1956, and it became his theme song, and in 1965 he sold a million records with his 'A Windmill in Old Amsterdam'. This became a children's favourite for many years and probably overshadowed his other 16 chart hits. The fashion in the 1950's was to remake tunes from America and Ronnie did very well with remakes of other's recordings. Ronnie Hilton in the late 1950's. Despite his recording career being overtaken by Elvis and later the Beetles he continued to be very popular singing as a guest on many television and variety shows. He appeared at three Royal Command Performances and even sang privately for the Royal Family at Windsor. However he did suffer from depression over the change in direction of his career. He also suffered a stroke in 1976 that took him a good few years to recover fully from. He was always busy in summer season work and performed in many pantos during the season. In 1985 his wife Joan died. They had three children together, Geraldine, Jane and Derry. A few years later he married Christine (or Chrissy) Westoll and they had a son, Simon. In the 1989 the British Academy of Song Composers and Authors awarded Ronnie Hilton their Gold Medal for services to popular music. He next came to the fore when he was chosen to present the Radio 2 programme 'Sounds of the 50's' in 1990. He was able to indulge in the songs of his best era. He continued to present it for around five years. At home he loved a round of golf and was a good family man. He was very proud of his Northern roots, despite being somewhat misguided and supporting Leeds United until he died! Despite not really making an impact in America he was part of the sound track of my life as my Dad was always singing his tunes when shaving in the morning. Very proud to add Ronnie Hilton to the list of Hullensians.